It all started in 1910 with Captain Scott and the loss of a tracked vehicle as it was being unloaded from his expedition ship, the Terra Nova. Since then the history of polar research and exploration has been littered with stories of vehicles dropping through sea ice, sometimes with tragic consequences. 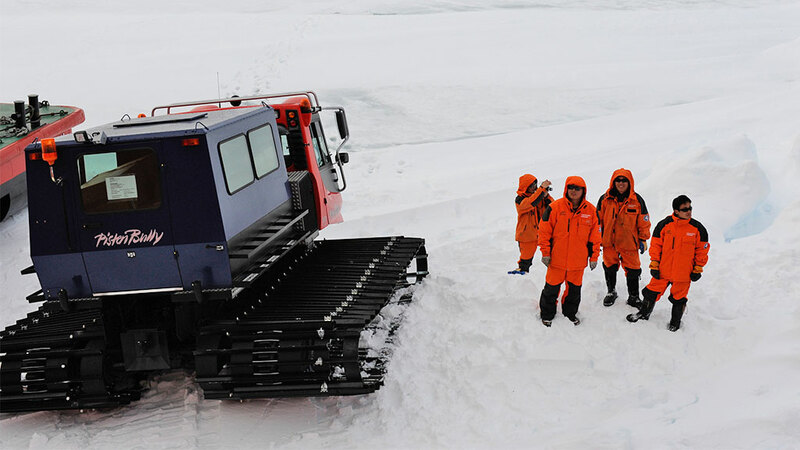 The 25th Chinese Antarctic Expedition has just added another one: A gleaming new, tracked Pisten Bully now lying at the bottom of the Antarctic Ocean, seats still covered in their factory plastic protection. Lessons will be learned, but this is in fact the first such incident to occur on a Chinese Antarctic expedition, and fortunately, thanks to some very quick and clear thinking, the driver managed to get himself out in time. Five days ago I wrote a piece explaining that the Xue Long was making extremely slow progress through sea ice about forty kilometres from Zhongshan station. Unfortunately, after trying every possible ice breaking technique, the vessel has hardly moved any further and is still a couple hundred metres from the secure fast-ice we are trying to reach. Faced with the ticking of the clock and need to get the Dome A team on their way in only to complete the fist phase of Kunlun station, three days ago the Xue Long's second helicopter, a Russian-built, cargo lifting KA-32 flown by two Korean pilots, was put into service. It has since been transporting fuel and other materials to Zhongshan station - four tons at time - in order to continue preparations and the loading of sledges for the traverse. But with five tracked vehicles still onboard and a lot of other cargo too heavy to air lift, it was decided that the Xue Long should also attempt to lock itself into a safe mooring position. This was achieved, followed by a comprehensive penetrating radar survey of the sea ice around the ship, which found that the ice, although often broken and uneven, was on average four metres thick or more. With the sea ice shifting continuously as summer approaches and temperatures start to rise, there were obviously also some weak points scattered around. It is one of these weak points that Xu Xia Xing (one of the most experienced technicians and drivers from past inland and Dome A traverses) encountered as he test drove the Piston Bully. The vehicle's seven tons were too much for the ice to carry, and it immediately crumbled under the weight. With his vehicle almost instantly submerged, Mr. Xu had the clarity of mind to open the sliding window on the passenger side so as to let water pour into the cabin. Although completely counter-intuitive, this brought in the necessary pressure inside the cabin to enable him to push open the roof hatch and let himself out. Mr Xu cannot say exactly how deep the vehicle was at this stage, but he thinks that he had to swim some three to five meters to the surface. There, he at first struck sea ice, but was able to find his way to the hole through which the vehicle sank, hauling himself out and waiting a few moments as rescue came from the ship. He fainted in a mild state of hypothermia, but soon recovered after being carried back on board. As Roald Amundsen famously said: "A man makes his own luck." This was a very close call, and Mr. Xu certainly made his. Thanks to some very quick and clear thinking, the driver managed to get himself out in time.